Hanoi Mike's Hotel 2 : No 3 Hang Phen Str, Hoan Kiem Dist, Hanoi, Vietnam. Warmly welcome to boutique hotel in Hanoi ! Hanoi Mikes Hotel - Boutique hotel where you can get the best services, enjoy your time to relax like in your home and enjoy some tours to discover the marvelous Vietnam ! Hanoi Mike’s hotel I has just been opened since July 2007, and from October 2008 hotel has been officially operated under the name of Mike's International tourism limited company (Mike's HN ., ltd Co). 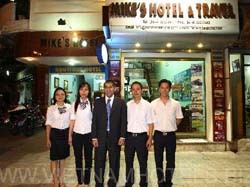 Because of fast growth in demand of tourists in July 2009, we opened new hotel chain namely Hanoi Mike’s hotel II. Both Hanoi Mike’s hotel I and Hanoi Mike’s hotel II are ideally located in the heart of Hanoi Old Quarter which is very famous over the world for cultural architects and historical relics of Hanoi Capital. From Mike’s hotel, it will take you just a minute to walk to the famous Hoan Kiem Lake (the Returned Sword Lake) that you can not miss while visiting Hanoi. Other well-known Hanoi tourist attractions like the Temple of Literature, One Pillar Pagoda, Ho Chi Minh Mausoleum and museum, Vietnam’s History Museum, Bat Trang Ceramic Village, Van Phuc silk...Halong Bay, one of the world Heritage and wonders is just about three hours driving away; Perfume Pagoda that is considered as one of the famous pagoda in Vietnam, and even the romantic Sapa... all are just a few hours away. Enjoying your time with Mike’s hotel, you are not only served with friendly and professional staffs but also with spacious and well infrastructures. 25 rooms with wooden floors, IDD telephone, air-conditioning, safety deposit box, cable TV with international channels, mini-bar, comfortable bath-tub and shower, hair-dryer, coffee and tea making facility, daily fresh fruits and flowers, Wifi, ADSL in each room, we hope that you will have unforgettable time with us.